On May 24, the international abortion provider Marie Stopes was allowed to run a television advertisement for abortion on British television. The ad encourages women who have an unplanned pregnancy to contact Marie Stopes for "help" if they're not sure what they're going to do. As Marie Stopes' web site makes clear, the only option they can "help" with is abortion. Marie Stopes International, a sexual health group akin to the U.S.'s Planned Parenthood that provides abortions and other services at clinics throughout the U.K., has purchased a time slot for a 30-second commercial scheduled to air Monday night, the Telegraph reports. The ad ? which does not mention the word abortion, but directs women to a 24-hour hotline after posing the question, "Are you late?"? has stirred heated debate and prompted condemnation from anti-abortion advocates and religious organizations. Right to Life of Michigan is happy to announce the winner of our 2010 Outstanding Prolife Youth Award is Tyler Perry of Tuscola County Right to Life. Tyler is a senior at Cass City High School and plans on attending Hillsdale College this fall. Tyler was a 2009 state finalist in the Right to Life of Michigan High School Oratory Contest. Tyler's volunteer highlights include speaking at several local prolife events and founding a prolife student club, Cass City Meant2Live, at his high school. To read Tyler's essay, you can go to our Youth Award page here. The 21st Annual Right to Life of Michigan Educational Fund Oratory Contest featured 23 high school participants. The competition was in Holt, Michigan, on May 8. Contestants each presented five to seven minute speeches concerning one of several prolife issues including abortion, infanticide, cloning and embryonic stem cell research. Casey Miller from Tri-Cities Right to Life claimed first place. Casey, a sophomore at Grand Haven High School, spoke about the harmful effects of abortion on women. Sarah Michalek from Sanilac County Right to Life came in second. Sarah, a senior at Deckerville High School, spoke about the dangers of human cloning. Katerina Parsons from Jackson Right to Life came in third. Katerina, a home-schooled junior, argued that abortion is wrong because every unborn child is a "person" with rights. Congratulations to the winners and all of the contestants for their excellent speeches! Be inspired and read more about the Right to Life of Michigan Educational Fund Oratory Contest. On May 17, 2010, West Virginia joined Michigan as a state which gives women considering abortion the right to see an ultrasound image of their unborn child before undergoing an abortion. The law passed both chambers of the West Virginia legislature by large margins and was signed on Monday by Governor Joe Manchin. View the text of the legislation online here. 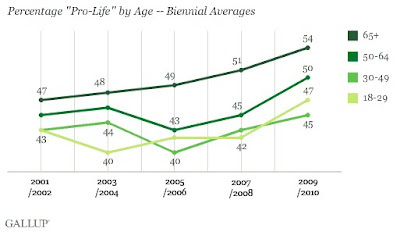 Being prolife is "the new normal"
Gallup has released results of a new poll on abortion. Slightly more Americans call themselves "pro-life" than "pro-choice," 47% vs. 45%, according to a May 3-6 Gallup poll. This is nearly identical to the 47% to 46% division found last July following a more strongly pro-life advantage of 51% to 42% last May. 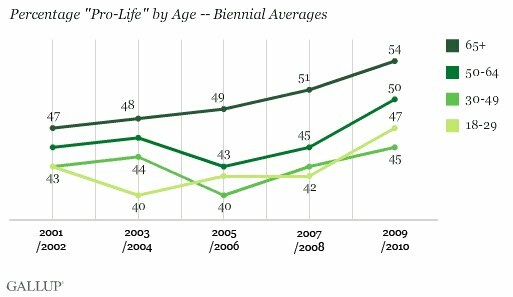 Both women and men are more likely to consider themselves prolife than pro-choice and the prolife label has become more popular for every age group. Below is a statement from Cecile Richards, the President of Planned Parenthood Federation of America (America's leading abortion provider) on President Barack Obama's nomination of Elena Kagan to the Supreme Court of the United States of America. If Planned Parenthood thinks Kagan's nomination is good news, then the nomination can't be good news for pregnant women and unborn children. "Elena Kagan is an accomplished and experienced lawyer and legal scholar who has been a trailblazer throughout her career. She was the first woman to be named solicitor general of the United States. Earlier in her career, she was also the first woman to serve as dean of Harvard Law School. "It is clear that Americans want a Supreme Court justice who has a deep understanding of the law, an appreciation of the impact of the court's decisions on everyday Americans, and a commitment to the rule of law and protecting our individual liberties. We are confident that Kagan will bring the dedication and commitment that have marked her career with her to the highest court in the land." Profits or women? What really matters to the abortion industry? See what a former Planned Parenthood director told the audience at Right to Life of Michigan's Legislative Day about how her former employer does business. During her speech Abby shared how she first became involved with Planned Parenthood as a volunteer during college and then quickly moved up the ranks until she was directing a Planned Parenthood before her 30th birthday. Abby also shared some inside information on how Planned Parenthood and other abortion providers do business. As a clinic director, Abby was tasked to meet specific patients goals for the various services her Planned Parenthood provided. During one meeting she noticed the goals for the number of abortion patients kept rising while the goals for non-abortion services like breast exams and colon cancer screenings stayed the same. She questioned her superiors about this situation and they noted the importance of bringing in more money to help Planned Parenthood’s finances. On May 10, President Barack Obama nominated 50-year-old Elena Kagan to fill Justice John Paul Stevens’ seat on the Supreme Court of the United States. For the last year as Solicitor General, Kagan has represented the U.S. Government in cases before the U.S. Supreme Court. Kagan has never served as a judge and has a limited record on the abortion issue. During her confirmation hearing for Solicitor General, Kagan was not asked about her position on abortion. In the past, she has criticized a Supreme Court ruling (Rust v. Sullivan) which upheld regulations which prevented Title X funds from going to projects which counseled women about abortion. After the announced retirement of Justice Stevens, President Obama was asked if his nominee would ever not support abortion and President Obama claimed he did not have an abortion litmus test for potential nominees but then said, “But I will say that I want somebody who is going to be interpreting our Constitution in a way that takes into account individual rights, including women's rights. That is something that is going to be very important to me." In the coming months, Kagan will appear before the Senate Judiciary Committee to answer questions about her judicial philosophy. If the Senate Judiciary Committee votes to approve Kagan, the U.S. Senate will then decide whether to confirm her nomination. Senate Judiciary Committee Chairman Patrick Leahy (D-VT) hopes Kagan will be confirmed by the end of the summer. Right to Life of Michigan will provide updates on when the Senate Judiciary Committee hearings will take place and when any votes on Kagan’s nomination are scheduled. Pampers has developed an application which allows individuals to follow the development of their unborn child with images and fetal development information. You’ve heard a lot about the ways your baby will develop during your pregnancy—now Pampers enables you to experience baby development like never before: at simulated life-size, right on your iPad. Enter your due date to track week-by-week typical progress and learn about the important changes happening. Hold the iPad in front of your tummy and see a typical representation of the baby, with richly detailed images illustrating his or her growth. Hello Baby is a whole new way to get your family excited to welcome its newest member. 3. Take the iPad wherever you go to share the exciting developments with friends and family. You can download the "Hello Baby" app here. This is completely untrue. Eva Feldman is doing research on ALS patients using cells derived from the spinal cord of an aborted child as page 1 of the patient consent form used in her work at the Emory School of Medicine clearly indicates. Proposal 2 did nothing to legalize research on cells obtained from tissue of aborted children. It legalized research on and the killing of human embryos created for fertility treatments and who are no older than 14 days old. Feldman’s comments show the length some University of Michigan researchers will go to in attempts to deceive the media and the public. Even after Proposal 2 passed they still feel like they need to lie about what Proposal 2 did and what research was legal in Michigan before Proposal 2. Unfortunately, reporter Ryan Beene failed to fact check any of Feldman’s claims.